This paper reports on a multiple-case study that investigated the potentials of simulation video games to facilitate intercultural development among L2 learners. Informed by the Intercultural competence model (Byram, 1997) and ecological approaches to L2 learning (e.g. Van Lier, 2004), data about seven L2 learners’ intercultural interactions with a game were collected through think-aloud protocol, interviews, gaming journals, and walkthroughs. The findings suggested that simulation games embody cultural values and practices, and can offer an engaging context for intercultural interactions. The presentation will review the study and discuss the implications of its findings for utilizing video games in L2 classrooms. This study aimed to propose a theoretical model that verified the structural relationships between Korean students’ use of digital English learning strategies, their affective domains, and individual variables, such as gender, duration of using digital devices, and digital learning experiences. For this purpose, a self-response questionnaire was developed based on previous studies. 720 Korean high school students and 430 university students participated in this study, and quantitative data were collected and analyzed through structural equation modeling (SEM). The results verified from SEM analysis could help ESL/EFL teachers understand how learners use and develop appropriate learning strategies in digital learning contexts. Cette étude porte sur le rôle de la technologie dans la réalisation d’une ressource éducative libre d’enseignement du français débutant, Français à la Nouvelle-Orléans, fondée sur des affirmations “Je suis capable de” telles que définies par ACTFL. Cette méthode systématise le recours aux nouvelles technologies non seulement dans la pratique des savoir-faire communicatifs, mais également dans le développement de la compétence interculturelle. Cette présentation fait l’objet d’une discussion des stratégies mises en œuvre pour systématiser l’intégration de la technologie du point de vue des affirmations « je suis capable de » et des réactions des étudiants faces aux tâches proposées. This presentation focuses on an international collaboration made possible through the Consortium for North American Higher Education Collaboration (CONAHEC) which promotes faculty exchanges between U.S., Canadian, and Mexican institutions of higher education. As a participant in the CONAHEC program, a colleague from the Universidad de Sonora and I co-designed and taught, a 100% online course in which students from Mexico and the U.S. were paired with international partners in order to explore issues of digital literacy. Those who attend this session will actively reflect on cultural and social issues that must be considered before implementing online international collaborations- especially those between countries of differing developmental status (developing versus developed countries). This presentation will introduce the role of the Joint National Committee for Languages (JNCL)–National Council for Languages and International Studies (NCLIS) with a focus on current issues surrounding world languages. Learn how language professionals advocate to Congress and the Executive Branch to promote world language education in the United States on your behalf and what these Official Delegates are doing to move federal policymakers to action. Understand the basics to become more engaged with your own voice for change. Building on a revised version of the Technological Pedagogical and Content Knowledge (TPACK) framework (Porras-Hernandez & Salinas-Amescua, 2013), I examine the reported experiences of multiple FLTAs adjusting to returning home and how (and whether) they can employ their knowledge for CALL practice. I examine FLTA’s experiences via interviews, email correspondence, and reflective writings. Classroom (micro), community (meso) and national/international (macro) level factors all affected their feelings of capability with CALL back home. FLTAs had very different expectations and feelings of capacity based on such factors, and I discuss strategies for assisting future FLTAs to leverage their new knowledge at home. This study focuses on the use of game speech and text in the “hero shooter” Overwatch. The researchers collected communication data of eight English as an Additional Language (EAL) learners over the course of 24 games, 12 quickplay, and 12 competitive. This study addresses communication features of EAL learners in game, how the mechanics and dynamics of “hero shooters” create language learning affordances, and how those affordances change depending on the stakes of gameplay. The data reflects that there are differences based on genre and stakes that need to be considered when applying games to language learning. In this study, we investigated sixty-one adolescent English students\’ and their teachers\’ perceptions of using clickers to learn vocabulary in an ESL context in Québec, Canada. Data were collected using survey questionnaires (5-point Likert scale items) and open-ended oral interviews that targeted many of the factors that contribute to L2 learning. The results obtained suggest that, overall, the participants in the experimental Clicker Group (n=31) surpassed those in the Control Group (n=31) on most of the target measures (e.g., these participants believed that they were more motivated to learn and that they had learned more vocabulary items). Des LMOOC au SPOC : quel format pour le développement potentiellement favorable à l’apprentissage de L2 ? Notre communication vise à explorer les formats des MOOC (Massive Open Online Courses) et des SPOC (Small Private Online Courses) mis au service de l’enseignement-apprentissage de L2. Après trois années d’expérimentation d’un MOOC de formation en Français Langue Etrangère (FLE), le Service Universitaire des Langues de l’université de Nantes met à disposition de son public d’apprenants un SPOC de Français Langue Étrangère (D’une langue à l’autre) de taille plus réduite qui se rapproche plus du format des cours de la formation à distance. Ce projet expérimental qui sera ouvert en février 2019 s’adresse à une pluralité d’apprenants internationaux en présentiel et à distance. This study investigates collaborative writing processes and learner interaction in a digital writing environment. 20 advanced learners of English completed two collaborative writing tasks in pairs as part of an English for Academic Purposes (EAP) course. Data sources included Google Docs revision histories, chat logs and screen recordings. The text mining tool DocuViz (Wang, 2015) was used to examine collaboration patterns in the learners\’ composition process. Chat logs and screen recordings were analysed for dynamics of interaction and quality of collaboration. Results will be discussed with regards to frameworks of dyadic interaction and their application to multimodal collaborative writing. This paper investigates how foreign language learners make and negotiate meaning through multimodal means of communication during the process of digital storytelling (Brígido- Corachán & Gregori-Signes, 2014). Our contention is that semiotic processes that contribute to the creation of a multimodal object, like a digital story, help to elucidate the symbiotic relationship between discursive and interactional skills, thereby creating ground for a shared epistemological expertise. The collective ‘fabrication’ of a digital story is significant in language learning and teaching (Robin, 2006; Gregori-Signes, 2008; Torres, Ponce & Pastor, 2012; Sevilla Pavón, 2015; Priego & Liaw 2017) and especially when viewed through the lens of socially shared cognition (Lave, 1991; Resnick, 1991; Wertsch, 1991 ; Wenger, 1998), as this helps us to better understand the underlying processes of the creation of a multimodal object. With this aim in mind, we will present the findings of two case studies conducted independently with two different groups of learners in different learning and pre-service teaching situations. Initial results highlight the role of a shared cultural dimension (the ‘maker culture’ of teenagers and young adults) of sociocognitive processes involved in the selection and the integration of elements while elaborating a digital story (Black, 2006). They also shed light on the effects of multimodal communication on collective scaffolding (Donato, 1994) and interdependance (Forsyth, 2010) which help in better understanding how multimodal communicative structures sustain discourse creation. Mobile applications are rich in their capacity to promote autonomous language learning. In this presentation, attendees will examine a variety of mobile apps, ranging from apps designed specifically to promote language learning to commercial apps designed for entertainment, for their capacity to engage students in meaningful language learning outside of the classroom. Practical considerations for empowering learners to engage autonomously, such as training them in thinking routines (Ritchhart, Palmer, Church, & Tishman, 2006) and language learning strategies (Cohen, Oxford, & Chi, 2002) while they are in formal spaces, will be highlighted and emphasized. Notre communication concerne une recherche sur le potentiel apporté par Twitter comme outil de collaboration et d’interactions plaçant l’apprenant dans une posture d’acteur social. Une fois avoir présenté les modes d\’intégration de cet outil de réseautage, nous discuterons des usages variés qui sont associés à son exploitation. Notre recherche tente d’analyser les facteurs qui semblent motiver les étudiants à participer à des interactions sociales et à se créer des espaces d’affinités (Gee, 2005). Notre analyse se base en partie sur l’approche (socio) interactionnelle de l’apprentissage et de l’enseignement des langues (Ollivier 2010 ; Ollivier & Puren 2011). This study examined the use of synchronous auto-translation tool in Japanese-Korean bilingual interactions on a social networking application, LINE. Chats and audio calls captured during online meetings of Korean and Japanese university students in two student organizations were analyzed using the framework of “digital CA” and the concept of “affordances”. Findings showed that participants designed their turns to enable best translation results, oriented to mistranslation in different ways depending on the type of activities being carried out, and used the tool to mitigate face-threatening situations. Implications for future studies and potential pedagogical benefits of adopting translation tools will be discussed. This talk reports on the Erasmus+ project FanTALES, which sets out to leverage practices of fan fiction and interactive fiction – the online maker cultures for creative writing – to engage secondary school learners in multilingual interactive storytelling projects based on popular media. The project develops materials such as learning-through-doing modules for teachers, as well as tasks and a web application for scaffolding the learners’ storytelling projects, and implements these in classrooms in Belgium, Sweden and Germany. Drawing upon classroom observations, teacher interviews, and samples of student writing, we report on the design process and on the challenges of implementation. This paper reports on a study investigating how task complexity, as defined by Robinson (2001), affects online interaction patterns in small collaborative writing groups using Google Docs and the quality of the resulting collaborative texts. Panel — 10:00 a.m. – 11:15 a.m. This panel aims to address the 21st century skills that language teachers will particularly need to adopt in accommodating a linguistically, socially and digitally diverse learner group as we move “from diversity to superdiversity” (Bloommaert, 2013, p. 193) in the constantly evolving tech-enhanced linguistic landscape. The growing inequity that exists among learners who have or do not have access to technology and thus digital literacy skills (Ortega, 2018) further complicates the language learning process. Specific issues in Kessler’s (2018) call for increased technology implementation in future language teaching will be explored through the lens of Ortega’s (2017) checklist towards achieving an “effective” and “successful” equitable multilingual social justice CALL-SLA instruction (p. 304). One significant development that has recently come to disrupt language teaching practices is the emergence of Open Educational Resources (OER). Research has focused mainly on the creation, reuse and sharing of OER, and little attention has been given to what teachers do with the resources. To date, there is scant evidence of OER reuse impacting on teaching practices and teachers’ professional development. This paper discusses the findings of a qualitative study which was conducted with a group of online language teachers to investigate the activities and thought-processes that teachers engage with when they reuse resources that have been created by others. Google Translate is frequently used by students, but little is known still about what effects its use has on student writing. This session presents a study of intermediate French students who wrote a series of compositions using Google Translate, WordReference (an online dictionary), or neither tool. Students using Google Translate after training improved more than those trained in using WordReference or who used neither tool. Students using Google Translate without training, however, showed less improvement than the other groups. A brief review of the literature will be presented, along with results and samples of student writing in French. In order to assess second language pragmatic competence, and as a contribution to the general understanding of Second Language Pragmatic Testing (SLPT), this study combines second language pragmatics and computer-mediated communication to assess the pragmatic knowledge of second language users of English. It uses Purpura’s (2004) framework of communicative language ability for developing interactive, email-based role-play tasks to assess test takers’ pragmatic ability with regard to sociolinguistic, sociocultural and psychological meanings, and the use of polite formulaic expressions. English language learners pursuing an academic goal need to acquire a great number of words that are essential for constructing content and conceptual knowledge in academic domains. Raising morphological awareness might contribute to building word networks among previously acquired vocabulary and activating prior knowledge when learners come across novel academic words. This session will demonstrate how animated pedagogical agents (APAs) triggered by QR codes are harnessed to teach 10 root morphemes in an adult ESL setting. Sample materials will be provided. Commercial mobile language learning applications attract millions of users worldwide; previous studies, however, have reported high attrition rates. Additionally, little research to date has addressed the relationship between users’ own motivations and potential gains in oral proficiency. This presentation centers on a recent study of 83 L1 English undergraduates at Michigan State University learning Spanish with Babbel, exploring the relationship between learner motivation (measured by intermittent surveys), learning activity (usage analytics), and improvements in spoken fluency (measured with the ACTFL Oral Proficiency Interview). The qualitative and quantitative data gathered inform technical changes to Babbel to reinforce user motivation. This presentation showcases a study on the use of a MMORPG (Club Penguin Island) by 20 Grade 6 intensive ESL students in the province of Quebec. Three tasks of different types (an information-gap and two reasoning-gaps, including one with a writing component) were carried-out in two intact classrooms. Following the activity, a questionnaire was administered to determine how participants viewed the game. Transcripts of the interaction were analyzed to reveal evidence of focus on form episodes and whether task type was a factor in terms of the frequency. Pedagogical implications point to the beneficial impact of MMORPGs for language acquisition with young learners. Developing L2 Sociolinguistic Competence through AR games: ça marche-tu? This bilingual presentation introduces Expériences, a place-based game, developed using the Augmented Reality for Interactive Storytelling (ARIS) platform and designed for L2 French learners. First, we will briefly discuss the game creation process with a focus on game narrative and the affordances of ARIS for targeting sociolinguistic variations. Second, we will report the results of a mixed-method study conducted at a Canadian university targeting the development of the sociolinguistic competence in French and exploring student perceptions of the game as a learning tool. We will conclude with a critical assessment of the platform and discuss implications for L2 learning. This study examined the use of Google Translate (GT; i.e., its translation, text-to-speech synthesis and automatic-speech-recognition functions) for the learning of second/foreign language (L2) Dutch vocabulary and related pronunciations in a self-regulated setting. Following a pre-posttests design, we examined participants’ autonomous learning of a small set of vocabulary/phrases and their pronunciations, combined with a qualitative analysis of video recordings of their self-directed interactions with GT, oral interviews and surveys about their learning experience. In the discussion, we highlight the importance of technology-enhanced self-regulated learning in L2 pedagogy and the implications for autonomous learning beyond the walls of the language classroom. Compound nouns, which are made of a noun that serves as a modifier and a noun that serves as a head, are productive in English and have an important contribution to ESL/EFL vocabulary acquisition. However, the meanings of less established compounds (e.g., student story) are not easily identified due to an unavailability of prescribed definitions. This presentation introduces a study that analyzed semantic relation between the modifier and head, which determines the meaning of compounds, using COCA. The results have been extended to an online dictionary that provides possible interpretation rankings for a chosen compound. Have you ever wanted to create an online multi-media instructional program that would provide engaging and challenging language and culture learning for students from beginning through intermediate levels? In this session, discover a content-based online French program that emphasizes cultural and linguistic confluence across selected francophone cities. At the same time, learn about the multiliteracies framework used to support language learning in a multi-media environment, participate in intercultural exploration of francophone societies, and consider the interdependent roles of language and culture as viewed through the lens of original multi-media French lessons. Presented in English with multi-media examples in French. To address a research gap, presenters analyzed patterns of learner-expert speaker interaction in an augmented reality place-based mobile game. The findings suggest that players took a “learning to play” approach (Arnseth, 2006). Additionally, expert speakers of English (ESEs) often positioned themselves as teachers by asking display questions, managing the task and encouraging participation. The English language learners (ELLs) tended to similarly position the ESEs. There were, however, some instances where ELLs took on more active roles by initiating small talk, using humor, or moving the task forward. The presentation will include specific recommendations for game design and implementation. In this presentation, we report on two virtual exchanges (Southern Arizona-Quebec and Southern Arizona-Kazakhstan) designed to connect students living in borderland regions and to engage them in multimodal analysis of their borderland experiences. The exchange centered on an innovative digital GIS platform that housed students’ digital artifacts (images, videos, 360 videos, digital stories) and documented how identity and space, both physical and digital, were experienced by borderland youth. We report on the pedagogical outcomes of this borderlands project, including: impact on students’ semiotic awareness/digital literacies, student and instructor attitudes, and critical digital literacy development among participants. Research informs us that engagement in extramural English (EE), i.e. English engaged in outside of educational contexts where the main aim is the activity itself rather than L2/FL English learning (Sundqvist & Sylvén, 2016) is beneficial for L2/FL learning. Studies have pinpointed digital games, where English is used, as a particularly fruitful environment for L2/FL learning. While such games primarily attract males, another arena catering to at least as many girls as boys, is YouTube. This presentation shows evidence of two very young L1 Swedish sisters who, by engaging in YouTube clips, have become “self-selected bilinguals” in Swedish and English. Brown (2017) reminds us that the socio-political context is crucial to defining and understanding digital literacies and the much wider concept of digital citizenship. He sees the goal of developing critical digital literacies as inextricably linked to enabling a greater sense of personal and collective agency among learners, both with and without new technologies to disrupt ‘a world where 1% of humanity controls as much wealth as the bottom 99%’ of the population (Oxfam, 2017). Drawing on Darwin (2017), I will argue that virtual exchange (VE) – formerly known as telecollaboration – provides the ideal setting for promoting a critical and sustainable approach to developing digital competence. Robotel has been supplying classroom management systems and language teaching platforms (SmartClass+) for more than thirty-three years. A few years ago, we began diversifying into the electronic publishing market by undertaking the development of a complete English language curriculum based on the CEFR proficiency standards, levels A1 through C1, (Let’s Talk! ENGLISH). Our Let’s Talk! authors are a group of American language teachers who had been using SmartClass+ in their language classrooms and were impressed by the impact on student learning – including; increased student speaking time, more opportunities for exposure to native pronunciation and better long-term retention of the target language. It made sense to architect Let’s Talk! using the capabilities already present in SmartClass+. As the project has moved forward, however, one of the synergistic benefits for Robotel has been that the demands of the didactics for learners with different proficiency levels have resulted in the expansion of SmartClass+ capabilities – especially in the area of auto-grading, self-access activities like pronunciation using AI-based speech recognition. Panel — 1:45 p.m. – 3:00 p.m. Following sociocultural perspectives that inform digital literacy practices, the present panel reflects on digital literacies and multimodality in the Spanish classroom from four different angles—assessment, learning contexts, translingualism, and identity—and discusses results that illustrate how to guide learners to be L2 digital literates through topics such as social justice, languages in contact, and culture in study abroad and at home contexts, with the help of genres such a digital storytelling and story mapping. The panel will offer examples of how students show linguistic, identity, cultural, and translanguaging development and provide pedagogical applications through the use of social tools. As mobile technology becomes more pervasive, there is increasing pressure to administer language tests via this medium. However, little research has been conducted to investigate the effect this change might have on the validity of those assessments. In this study, an English proficiency test was administered to ESL students on both mobile phones and on computers. Two equivalent test forms with sections in reading, writing, listening, and speaking were administered to 150 English language learners. We will report the scores on the different sections and what effect the technology had on the results. Mwami et Moi is a visual novel based game teaching about village culture in Eastern Congo, while also helping players develop their French. The player makes choices as the Mwami (leader / tradition keeper of the village) with the goal to lead the village to prosperity. Additionally, the player is introduced to Mashi, the local language. With a lack of games with African narratives, this game is likely the first to look at this particular culture. Additionally, there will be video and other pedagogical supports for this game to be used individually, or in a traditional classroom setting. Educators of adult English learners with limited native language literacy usually have limited access to resources and effective instructional reading strategies. This session presents the challenges and implementation of e-games (electronic-games), which has been defined as games that employ electronics to create an interactive system to engage adult refugee students with limited literacy in an interactive way. This session, moreover, demonstrates the employment of various e-games to not only meet the student learning objectives but also to review previous lessons, engage students in group activities, and conduct summative assessments in interactive ways to assist learners in improving their reading skills. The increasing use of the Appraisal framework in telecollaborative contexts, in particular the Attitude component, calls for a need to validate its use in L2 research. The preliminary results of this study, which presents data gathered from two bilingual (English and Spanish) telecollaborative encounters using this framework, indicate that, despite the differences in the design of the encounters (topics for discussion, communicative tools, and tasks), participants from both studies presented similar attitudinal behaviors, mostly in terms of Judgment and Appreciation. These similarities seem to the result of a desire to converge with the partner in order to collaborate more effectively. You may know ISO — the International Organization for Standardization— for its work in areas such as food safety, medical devices, and information security. But did you know that there is also an ISO committee that creates standards to guide education around the world? Come learn about the work of ISO Technical Committee 232 (ISO / TC 232) and the standards it has created on language learning, assessment, and distance learning. And find out how you can get involved as ISO / TC 232 expands its reach and begins its work on new international standards for K-12 and higher education. This bilingual presentation describes the design and delivery of intermediate level student-driven, student-centered open educational resources. French materials are showcased. A PressBooks interface with H5P interactivity and integrated form quizlets, along with a Hypothes.is overlay, allows students, student researcher-developers, and faculty to engage in asynchronous exchanges about different aspects of this task-based learning. The materials, based on proficiency targets and communicational modes, cover four units that evolve from focus on the self, to self and other, to social and cultural contexts, back to the learners as they look forward to their professional, civic and personal global futures. This study builds on a small but important number of studies that explore social justice in CALL (Anwarrudin, 2019; Gleason & Suvorov, 2019; Ortega, 2017). During a six-week online intercultural exchange (OIE), 14 students from a small northeastern US university and 15 Nicaraguan peers whose university classes had suspended due to the country’s state of unrest used multiple WhatsApp chatrooms to discuss social justice issues in their communities. Despite students’ enthusiasm and participation, the project was not without its own problems and ended abruptly. The presentation will discuss its challenges and achievements and draw preliminary conclusions about how social justice projects involving OIE might be improved. This presentation provides a brief overview of the EVOLVE project whose goal is to mainstream virtual exchange (also known as telecollaboration) across disciplines in institutions of higher education. It reports on the project\’s initial stages and outputs with a particular emphasis on the challenges and solutions that arose in concurrently training both language and non-language educators in virtual exchange. This study examines the text-to-speech synthesizer (TTS) as an autonomous learning tool for the development of L2 phonological awareness (Liakin et al., 2017) by focusing on English /i/ (beat) and /I/ (bit) vowel contrasts. Participants interacted with a TTS application to solve a set of language-related problems and completed pre-tests and post-tests for perception, production and phonological awareness. TTS was viewed as a multimodal semiotic tool that provides object-regulation through multiple modes (Kress, 2010). Our discussion highlights the positive relationships between learners’ strategies for self-scaffolding, use of TTS as a semiotic tool, and development of phonological awareness. Panel — 3:15 p.m. – 4:30 p.m.
How can we as CALL teacher educators best prepare our teachers for dealing with issues of social inequality? This panel will explore four wide ranging social justice contexts that include elements of maker culture: 1) a study about the value of digital game use, 2) an OER resource center for rural language teachers, 3) a project training teachers to work with refugee children in Iraq, and 4) a class for Indigenous language teachers developing multimedia materials. The panel will conclude with a synthesis of the discussed contexts and relate these to broader implications for teacher educators. Graduate student writers regularly struggle with writing, and temporal and locational restrictions may compound the process if students cannot receive face-to-face guidance from the university writing center. To better serve both native and non-native speaking students, a graduate communication center at a large Midwestern university incorporated the use of a video-conferencing software to allow students’ synchronous computer-mediated communication (SCMC) with graduate peer writing tutors. Using surveys completed by the writers and their tutors, we investigate how this SCMC environment facilitated student engagement and promoted revision. Findings point to directions for developing best practices for using SCMC in graduate writing centers. Developing intercultural communication competence (ICC) has increasingly become one of the main goals of foreign language acquisition. However, this goal can hardly be fully achieved without communication with members from the target culture. This session will report the findings of the development of ICC among intermediate-level L2 learners of French through a semester-long weekly video-base synchronous CMC with Francophone native speakers. Results from pre- and post-surveys based on Byram’s (1997) ICC framework as well as from participants’ journal entries and classroom discussions will be shared. The design, implementation, and researchers’ reflection of the present study will also be reported. Technology offers ever-increasing opportunities to bring the target culture to life for students in WL classrooms. Students can engage with target culture products and practices through virtual explorations and use their language skills to gain insights about target culture perspectives from online authentic resources.This presentation outlines a project from a third-semester community college Spanish class in which students used Google Earth and Tour Builder to plan a virtual trip. Engaging with numerous authentic resources, students read reviews and virtually visited numerous sites, and then shared their experiences with other students. Sample student work and reflection comments will be shared. This ethnographic study explores the creation of a digital maker culture (DMC) with teacher trainees using educational technology for the purpose of language teaching. Findings suggest that the use of multimodal assignments aids in the process of creating a DMC, as it meets the needs of different learning styles. Also, the use of mentors acting as an additional layer of support helps the teacher trainees to better understand the process of creating a DMC. This has implications in the development of future online courses that instruct teacher trainees to create DMCs within a specific language skill and teaching context. The presenters will describe the evolution of a course in Computer Assisted Language Teaching offered to graduate and undergraduate students. Coming from varied backgrounds both with technology and with teaching and learning languages, these learners are exposed to a variety of technologies, some designed explicitly for language learning and others (such as Minecraft, Fanfiction, DOS-based games, and Virtual/Augmented reality) that can be aligned with language learning objectives. Participants engage in student-led discussions of CALL literature, a self-directed research paper, a collaborative exam, and a hands-on project – a technologically-enhanced series of language lessons designed for a particular set of learners. Marie-Josée Hamel is a Professor of Applied Linguistics at the Institute of Official Languages and Bilingualism at the University of Ottawa, and a Faculty Research Chair in Technology-Mediated Language Learning. She has been actively involved in CALL teaching, research and development for over twenty-five years. Her background is in theoretical linguistics and in language engineering. Her interests are in CALL ergonomics, natural language processing and learner corpora, L2 didactics, advanced French learners (in particular, their lexical competence), and teacher training in CALL. Dr. Hamel has published numerous papers and been an editor of several special issues on these topics in CALL journals. She has been a key partner in funded (inter)national research projects. 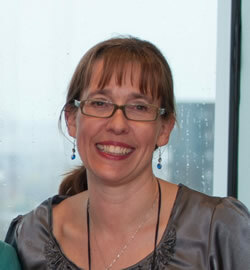 Marie-Josée Hamel est professeure de linguistique appliquée à l’Institut des langues officielles et du bilinguisme de l’Université d’Ottawa et titulaire d’une chaire de recherche facultaire en apprentissage des langues médiatisé par les technologies (ALMT). Elle est activement impliquée dans l’enseignement, la recherche et le développement dans ce domaine depuis plus de vingt-cinq ans. Mme Hamel possède une formation en linguistique théorique et en ingénierie linguistique. Elle s’intéresse à l’ergonomie en ALMT, au traitement automatique du langage et aux corpus d’apprenants, à la didactique des langues secondes, aux apprenants avancés de français (en particulier, à leur compétence lexicale) et à la formation des enseignants à l’ALMT. Elle a publié de nombreux articles et a été rédactrice en chef de plusieurs numéros spéciaux sur ces sujets dans des revues sur l’ALMT. Mme Hamel a été une partenaire clé dans des projets de recherche (inter)nationaux subventionnés.